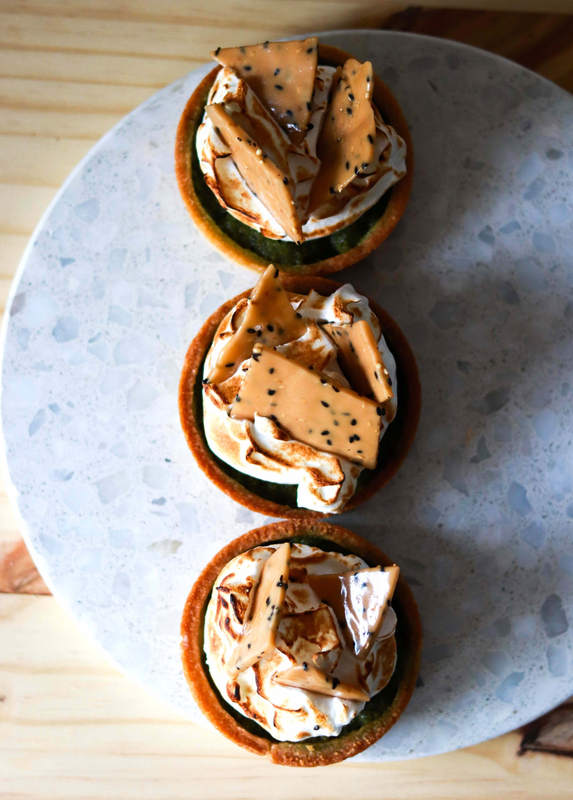 This matcha almond tart with swiss meringue and sesame brittle wonderfully plays with the popular Japanese dessert flavours – Matcha and Sesame. The earthy taste of the matcha almond filling pairs perfectly with the caramel, nutty taste of the sesame brittle that’s on top of the dreamy toasted Swiss meringue. This tart came as a total surprise for me, because I originally made the matcha almond filling for Mont Blanc, a classic French dessert that’s made with chestnut puree and meringue. Unfortunately, there were lots of issues in the making and the mont blanc didn’t turn out as well as I expected so I decided to use the filling for something else. I promise you all that I will perfect my mont blanc recipe and share with you when the time comes around! And I do want to talk a bit more about the sweet pastry here. I recently bought some new tart rings that I had been craving for so long due to its more sophisticated finish. There’re quite a few methods out there to line pastry into these circular rings. After testing out on all the methods, I do find that the method of cutting out a larger circle of pastry and directly fit that in to the ring is the easiest and the most guaranteed. If you wanna watch how to do it in a video, I’d recommend Cupcake Jemma’s tutorial video Alternatively, you can also cut out circles of pastry that are almost the same size as the base of your tart ring, as well as strips of pastry to fit as the sides. And you are gonna push the edge of the base to stick with the strips. Personally, I do find this a bit more tricky as sometimes as the pastry is too dry, the strips won’t stick too well with the base and they’ll separate when baked. As you’d all notice, I am recently super obsessed with meringue (the feeling of blow-torching meringue is just incomparably satisfying), so I decided to incorporate it into this tart to add another layer of texture. From top to bottom, you get the crispiness of the sesame brittle, the softness of the swiss meringue, the creaminess of the matcha almond filling, and the crunch of the sweet pastry. I chose to use Swiss meringue this time because I wanted it to be firmer and finer to top the tart with. And I adjusted the sweetness of the meringue recipe so it won’t be overwhelmingly sweet. I hope you enjoy the recipe! Rub together cold butter, sugar and flour to a fine crumb. Add egg and mix to a dough. Wrap dough with plastic and rest in the refrigerator to firm up until needed. While your dough is resting, preheat your oven to 180C. Dust your work surface with flour to avoid sticking. Roll pastry to 3mm thick and line into 6 small tart rings. Poke holes on the pastry with a fork and put it back into the fridge to rest for 30 mins. Using an electric mixer, beat butter and sugar on medium high speed until pale and fluffy. It will take around 5 minutes. Add egg and beat until incorporated. Add almond meal and matcha powder into the sugar-butter-egg mixture. Mix with a spatula until it forms a paste. Add milk and mix until incorporated. If your tart shells are ready by now, fill them with the matcha almond filling (only to 85% full as they expand when baked) and bake for 10 mins. Let cool completely. Add egg whites and sugar to an oil-free bowl. Using a double boiling method, gently heat the egg whites mixture up, while whisking constantly, until temperature reaches 140F (60C). The sugar should have completely dissolved at this stage. Add the hot egg white-sugar mixture to your electric mixer mixing bowl (oil-free). Whip on high speed until the meringue is thick and glossy, and the bottom of the bowl feels cool. This will take about 7-10 mins. In a saucepan, combine the butter, sugar, water, and salt and cook over medium-high heat, continue stirring until the mixture reaches 260°F (127C). Add the sesame seeds and continue cooking while stirring constantly, until the mixture reaches 350°F (177C). Stop cooking if you see the mixture turns into a golden brown color. Remove from heat and immediately pour the mixture into the prepared parchment paper, spreading it with a palette knife into an even, thin layer. Set aside to cool until firm. Once the brittle is cooled, break it into pieces of your desired size. Spoon or pipe the swiss meringue on the tarts and create some “peaks’ with a spoon. Insert the sesame brittles into the meringue. Toast the meringue with a blowtorch.